Government: Varies by dale; Dales Council loosely unifies all dales. The Dales are broad forest vales with rolling farmlands, linked by narrow trade roads running through beautiful woods. Blessed with fertile soil and a temperate climate (aside from the extremely harsh winters), the Dales are the breadbasket of the Heartlands. The Dales' independent spirit and age-old alliance with the elves of Cormanthor have made them the historic birthplace or favored home of many of Faerûn's greatest heroes. Eleven separate dales exist today, each with its own territory, government (or lack of it), militia, trading pacts, ambitions, and character. Archendale and Harrowdale value trade over all else. Tasseldale values industry and craftsmanship. Daggerdale stands alone against a powerful enemy, while Scardale struggles to recover its independence after years of occupation. Meanwhile the other dales respect the old Dales Compact and prefer to be left alone. Although they share common traditions, cultural practices and religious allegiances, the Dalelands are not a unified kingdom like Cormyr or Sembia. Instead, they are an enigma to the rest of Faerûn. How can small and disorganized groups of stubborn, back woods farmers and craftsfolk maintain control of the coveted lands surrounding the great elven forest? In the past, the forest itself was a major reason for the Dales' continued existence, as the presence of the Elven Court deterred most foes. Now that the elves are a secondary power in Cormanthor, Dalesfolk rely upon the gifts they've always had: heroism, self-reliance, and a strong, almost clannish sense of community. To an outsider, Dalesfolk seem close-mouthed, suspicious, and reserved. Until newcomers are identified as friends or foes, or vouched for by a trusted friend, Dalesfolk prefer civil silence to empty pleasantries. Once a person is accepted, Dalesfolk are generally open and giving, especially in the common defense. Once accepted by Dalesfolk as a friend, a stranger is expected to contribute to the defense of the community. Most dales maintain at least an informal militia. The training levels and professionalism of such groups varies, but all are capable of providing some training with a melee weapon and a good Dales longbow. The archers of the Dales might be the finest human archers of Faerûn, which gives would-be invaders pause. The Dales were once deep woods hunted only lightly by the dragons, for these creatures preferred to make meals of ogres, deer, bears, and rothé available in the open Stonelands to the west. As the wyrms declined and elven might grew, the elven realm of Cormanthyr flourished. Humans hailing from lands known today as Chondath and Impiltur, settled the edges of that great forest. These migrations attracted folk from other regions of Faerûn: exiles, fugitives from justice, and adventurers who saw a land of bright promise. Scattered human farmsteads and hamlets began to appear at the fringes of Cormanthor around -200 DR. Elven defenses hampered woodcutting, so human settlements were scattered and isolated instead of sprawling across wide-open farmland, as they did in the lands that would become Cormyr to the west and Sembia to the south. Foreseeing the eventual doom of his people if they tried to fight off increasingly numerous human settlers, the elven coronal Eltargrim arranged the Dales Compact between the elves of the empire of Cormanthyr and the humans who would become known as Dalesfolk. Human and elven wizards together raised the Standing Stone in the center of Cormanthor as a symbol of unity between the two races. In return for promising not to cut deeper into the Cormanthor forest, the ancestors of the current Dalesfolk were allowed to settle around the forest's edges or in places where the great trees did not grow. While the early dales struggled to survive, the elves of Cormanthor grew strong and confident. In 220 DR, the elven coronal allowed humans to enter his kingdom. In 261 DR, he made the fateful decision to welcome them into its very heart, transforming elven city then known as Cormanthor into the open city of Myth Drannor. All races were welcome in Myth Drannor, which enjoyed a golden age that lasted nearly five centuries. Myth Drannor reached heights of arts, crafting, and culture unsurpassed since, and the city brought human, halfling, dwarven, and gnome trade, travel, and settlement to the Dragon Reach lands. Myth Drannor's rise allowed the Dales to survive their troubled infancy. The city's fall in 714 DR gave the Dales the chance to flourish in ways that would have been impossible if elven might had remained intact. Few survivors of Myth Drannor's collapse escaped the demons, devils, and dragons that flocked to the ruins, but survivors took the scraps of their wealth, magic, and learning to the nearby dales. Although the Compact stands no more, most of the Dales still abide by its terms. Tradition has replaced elven might as the principal motivation for adhering to the Compact, but for now it is sufficient to preserve Cormanthor's borders as they stand. Each year at Midwinter, every dale sends a delegate to a selected Dalelands town for the Dales Council. Delegates debate issues affecting all the dales, such as maintenance of trade routes, defense pacts against Zhent or Sembian aggression, border squabbles between neighboring dales, and matters relating to the great forest of Cormanthor. Two serious attempts have been made to unify the Dales. The first was under the legendary Aencar the Mantled King, who sought to forge the Dales into one realm but was slain in 1044 DR. His dream died with him. The second would-be unifier rose and fell in 1356 DR. Lord Lashan of Scardale overran Battledale, Featherdale and Harrowdale, proclaiming his intention of conquering all the Dales. Lashan vanished after his defeat in the great battles in Mistledale and Shadowdale; but his legacy initiated a string of bad luck that has plagued Scardale to this day. In the current year, 1372 DR, the Dales face a number of terrible threats. The enemy they know best broods to the north in Zhentil Keep. An unsuspected enemy has just arrived to create the Empire of Shadows in the wastes of Anauroch. And in their Retreat to Evermeet, the elves left the great forest of Cormanthor open to exploitation by another great foe, the drow. The drow might not be the worst enemy the Dales face. The Dales Compact is fraying. For over thirteen centuries, this treaty has survived treachery (usually human), magical disasters (usually elven), and pressure from would-be colonizers (Sembians) and conquerors (folk of the Moonsea). With the elves of Cormanthor now in Evermeet, what remains of the Dalelands' agreement to preserve the forest by cultivating only land that was already cleared by natural forces? The people of some dales, such as Archendale, have already welcomed the chance to log and exploit the elven woods. Residents of other dales, such as Deepingdale, did all they could to encourage elves to stay in the forest. At the next Dales Council meeting of 1373 DR, the two most pressing topics are likely to be the drow occupation of Cormanthor and the fate of Scardale. The drow press hard upon the holdings of those dales nearest Cormanthor. Other dales have yet to be affected by the fight. One of these is Daggerdale, the site of next year's Council meeting (still half a year away). Daggerdale's worst enemies are the Zhents, who helped create Scardale's miserable situation. It remains to be seen if the dales can agree on actions against either of these enemies. Walking beneath Cormanthor's giant maples, looming shadowtops and towering oaks, humans soon realize that they have entered world that does not need them. The great forest is a living testament to a forgotten green age, a time in which humans were an afterthought instead of the dominant society. During the Elven Retreat, more than 90% of the elves who Cormanthor home left for Evermeet or moved west to Evereska. A few remained, particularly in the Semberholme area near Sember and in the communities of Bristar and Moonrise Hill in Deepingdale. Others, who had human mates, human friends; or half-elf children, stayed on in other parts of the Dales. The formal life of the Riven Court has given way to the hunting of the ranger and the steps of the druid. Though Cormanthor is still beautiful, and still very much a high forest worthy of bards' songs and poets' flights of fluttering adjectives, it now shudders at the felling of trees in its fringe and the sounds of stealthy battle in its heart. War is brewing in Cormanthor as humans, elves, drow, and gnolls struggle to carve their settlements from the green fastness and establish strongholds and' borders they can defend against their rivals. The old Riven Woods stretch for hundreds and hundreds of miles. They may prove expansive enough for all the competing powers and settlements. The drow, the elves, and the occasional human settler can go days and even tendays within the forest without running into signs of each other's existence. But even Cormanthor might not be large enough for all of these races to share. Cormanthor itself is the dominant feature of the entire region. Once the great forest extended all the way to the Dragon Reach, covering the lands that are now Sembia and Cormyr. Even after thousands of years of human encroachment, the great woods Of the Riven Court are the mightiest forest-land in this part of Faerûn. Lake Sember: This beautiful lake in south Cormanthor is the heart of the elven community of Semberholme. Full humans are seldom welcome near the lake's waters, which are regarded as the heart of elven life here. The elves created most of the forest's wonders, but humans and mad deities have left permanent scars. Elven Court: The Court covered a wide area. Elves like living space, so they leave enough room to allow the creatures of the forest to pass naturally between elven tree-homes without feeling trapped in a city. The Court influenced the entire northwest quarter of Cormanthor, even if it was only to create a series of cunningly landscaped glades linked by beams of sunlight and miniature stepping-stone portals. Even though the moon and sun elves of the Court dismantled their greatest structures during the Retreat, the shaped tree-homes of the former Riven Court still offer the most comfortable and defensible habitation in Cormanthor for surface drow, who have decades of practice dismantling elven defenses and overcoming green warders. Of the drow, those of House Jaelre spend the largest part of their time establishing themselves in the area of the Court. Unlike previous plunderers, they avoid the elven barrows beneath the home trees, as the drow would rather not waste time fighting elven guardian spirits until they have a secure hold upon the forest. Moander's Road: Moander, a power of corruption and rot, had been thought dead since the days of Myth Drannor's glory. In truth, Moander slept in the ruins of Yullash, north of the Dates in 1357 DR, Alias of the Azure Bonds unintentionally woke the old deity who arose and plowed a course of devastation toward the ruins of Myth Drannor, intending to absorb other magical energies to sleeping in that perilous site. Alias and her companions managed to stop Moander after he destroyed a wide swath of forest. The damage to the forest has regrown poorly. The "road" now is afflicted with strange fungi, loathsome oozes, and plant monsters. This does not prevent Zhent agents from using the road as a quick (and, for them, safe) path to Myth Drannor, but they avoid the high hill that is the dead god's corpse. Myth Drannor: Myth Drannor is arguably the richest and most dangerous adventuring site in all of Faerûn. It's actually dozens of sites in roughly the same location, the ruined remains of the high elven and human city that was once the greatest magical place the world. Myth Drannor was the seat of an incredibly powerful civilization, and gold, magic items, and other worthwhile debris still rest everywhere here along with their magical guardians and invading creatures. Human, nonhuman, and monstrous adventurers who enter the ruins frequently leave their possessions, their corpses, and even their souls behind, new pickings for the next vile cult, ambitious magician, or adventuring party that comes by. In centuries past, a form of elven high magic known as a mythal protected the ruins of Myth Drannor. When the elves moved to Evermeet, the mythal weakened. The laws of magic vary inside Myth Drannor, but most of the space- and time-distortion effects created by the mythal have faded out. Semberholme: The oaks and maples fed by Lake Sember's pure waters soar high above the rest of the forest, creating a cathedral-like retreat for elves who wanted to escape from the politics and whirl of the Elven Court The limestone caves that formerly provided the elves with a perfect refuge now supply the surface drow with splendid hideouts. Given the proximity of Bristar and Moonrise, and the area's historic importance as one of the three main elven communities of Cormanthor, Semberholme could be sorely contested in times to come. Standing Stone: The huge plinth of glossy gray rock, erected to commemorate the Dales Compact between the Elven Court and the new Dalesfolk, still stands proudly in the forest. The stone magically repairs all damage to itself, so the elven runes winding around its base, outlining the particulars of the treaty, can be clearly read 1,372 years after the plinth's creation. Originally, the Standing Stone was not as accessible to humans. When Rauthauvyr of Sembia forced his road through the forest, threatening war if he was not allowed to build, the elves routed the road within sight of the Standing Stone. It pointed out that humans who were the elves' friends did not need to resort to violence to achieve what they wanted. Tangled Trees (Small Town, 1,168): After the Elven Court and Semberholme, the Tangled Trees was the third great community in Cormanthor. It was largely populated by youngsters, warriors, adventurers, half-elves, and rogues who did not join the Retreat. Tangled Trees would be the largest elven community in the forest, but many of its residents are elsewhere at any given time. The Elven Court and Semberholme consist mainly of widely spaced family dwellings and some common areas, but the Tangled Trees is known for its interlocked trails, webbing, platforms, and tree forts occupied by the community's eclectic group of elves, half-elves, and occasional human friends or lovers. In winter, when the wanderers come home and the patrols decrease, the actual population of the Tangled Trees is double that listed above. Vale of Lost Voices: The Vale of Lost Voices cuts across Rauthauvyr's Road between the Standing Stone and Essembra in truth, the Vale came first and it was Rauthauvyr's bad luck to forge his road across its ancient elven burial grounds. Travelers who stay on the road are safe enough. Humans who stray off the road into the forest in the Vale of Lost Voices risk encounters with elven ghosts and guardian spirits that take years off their lives or slay them outright. The area is sacred to elves, who occasionally visit it alone but never in groups. Elves do not build or settle in the area. The drow avoid the area even more assiduously than humans do. There was a time when deep, green forest stretched unbroken from the Sea of Fallen Stars north to the Tortured Land, west through the Thunder Peak passes, and around the Stonelands to the Storm Horns. Trees cloaked both shores of the Dragon Reach, broken only by occasional peaks, deadfall glades where huge trees plunged to earth, and the burned scars of lightning-strike fires. Then came the elves, the first gardeners of the forest. They found haunting, sacred beauty around Lake Sember. They saw the works of their high gods farther north, near Elventree. They settled in the latter place, still known as the Elven Court today, and tended the woods as carefully as any royal gardener. The elves broke the "evershade" beneath the trees by creating magical glades. Great and terrible beasts were largely slain or driven off in eldritch hunts. 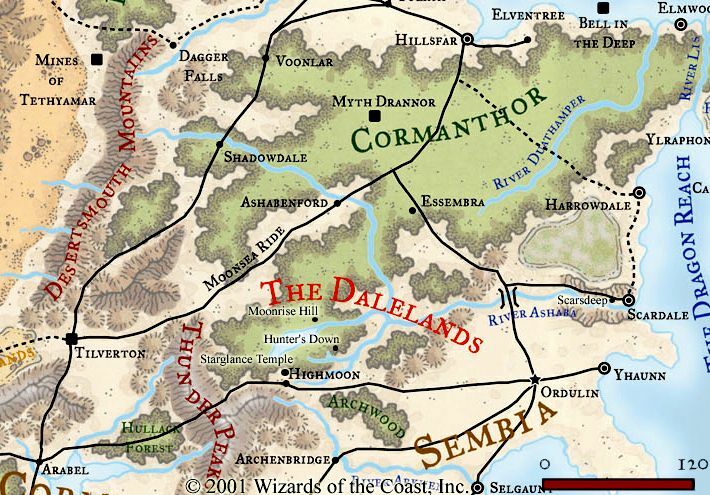 The kingdom of Cormanthyr in the great forest of Cormanthor was founded approximately four thousand years before the creation of the Dales and the start of Dalereckoning. For a time, the elves lived freely in their great forest, but the millennia of elven rule were over once humans entered Faerûn. The elves watched with increasing anger as humans clawed at the borders of the once-endless wood, cutting it ever smaller, forcing roads and trails through undisturbed forest. Woodcutters, adventurers, and homesteaders who penetrated too boldly into the green vastness of the old elven forest often met their ends under elven arrows. Yet humans came in waves, as numerous as gnats. Oak after oak fell to their axes, then the shadowtop and duskwood trees, and they brought swords and wizards of their own to contend with elven arrows. Farsighted elven leaders saw that the heart and strength of the elves would be worn away if they fought humans at every turn. Such battle would only leave them weak before orc hordes, drow forays from the realms below, and strokes from the divine powers, such as merciless "wolf winters" and flights of dragons. So they welcomed humans as allies and, even gave passage and settlement room to gnomes, dwarves, and halflings. These were the early years of the Dales Compact that created the Dales. The elves sought to make peace with the humans rather than fighting against them, but remained wary of their neighbors. To guard themselves and a vestige of their original realm, the elves raised great areas of magic called mythals within the borders of Cormanthor. Each mythal was the product of an elven high magic ritual that created a magical field governing various conditions within its confines. Some mythals protected the forest by inhibiting fires and explosive magic; others increased the power of spells drawing upon the elven deities or elven scrolls while suppressing non-elven magic. As the centuries rolled on, the elves of Cormanthor layered forest with portals, invisible hideaways, and wards. Thus, the elves made the woods alive with magic. Unfortunately, elven high magic has a steep price. Riddled with portals, the great forest was more open to portals created by others, threatening the realm with attacks from its enemies and dooming the mythals to eventual decay. Today, the once-bright city of Myth Drannor is a fiend roamed, haunted ruin. The rest of Cormanthor is not nearly as dangerous as Myth Drannor, but centuries of magical wards, portals and summonings have turned certain parts of the forest into areas that only the skilled, wood-wise, or magically gifted can expect to survive without harm. For many years, the fiends and decaying high magic of Myth Drannor were widely held to be the greatest peril of the Elven Wood, now an even greater danger has appeared - the return of drow to the surface world. As the last few decades of the Elven Retreat left portions of the Elven Court and its surrounding forests virtually unoccupied, some drow factions in the Underdark -particularly those who owe their allegiance to Vhaeraun rather than Lolth - contemplated a return to the surface world. First as small scouting parties, then as larger warbands, and finally as conquerors with trains of slaves and belongings, the drow have established themselves in the deep places of Cormanthor. The drow have not been present in Cormanthor far long, but they've made themselves known with raids against Archendale, Battledale, Deepingdale, and Mistledale. Incessant raiding and murder in the forest may not be the worst the drow have to offer Dalesfolk. The Great Druid of Cormanthor went missing near Myth Drannor shortly after the drow invaded. The story passed on to druids through the animals of the forest is that he perished in a great battle with a demon summoned by drow newly arrived in Myth Drannor. The only consolation for Dalesfolk is that the druids say that Great Druid killed his demonic attacker as well. Even more alarming than the prospect of a war in Cormanthor's shadow is the drow interest in the abandoned realm's ancient mythals. The drow seek to twist Cormanthor's ancient mythals into shapes that please them. Elven high magic effects that please such beings, however, are likely to demoralize and enfeeble humans and elves. The drow could never create powerful mythals on their but with time and study, they may master the magic of the Elven Court and permanently darken the great forest. Those elves have returned from Evermeet know this and work constantly to conceal old magic from the drow or defend sites too large to hide with the most powerful guardians they can find. Although it is not widely known, the drow who have moved Cormanthor are divided into several factions. Several groups of drow compete and even cooperate to turn Cormanthor into their new fortress home. The main factions are described here, with brief notes on other drow forces in Cormanthor. Auzkovyn Clan (3,505 drow): For centuries the Auzkovyn drow (so called after the long-dead founder of their clan) wandered in uppermost reaches of the Underdark and occasionally took up residence on the surface. About two hundred years ago, the Auzkovyn carved out a small fastness in the heart of the High Forest, determined to forge a surface homeland despite the wealth of enemies present in that location. While the Auzkovyn wore away their strength in constant warfare, the wood elves of the High Forest - never proponents of the Elven Retreat - grew stronger and more vigorous; intent on reestablishing the ancient elven kingdom of Eaerlann. The surface drow of the High Forest recognized the growing strength of the wood elves and realized that they had little but incessant warfare to look forward to. After long and secret effort, the High Forest drow created a portal that led into Cormanthor - specifically into the Underdark near the Abbey of the Sword. Although the Tempus-worshipers deflected the Auzkovyn assault by destroying this first portal the rest of the High Forest drow quickly forged a second to join their vanguard in the forests north of Battledale. Unlike House Jaelre, the Auzkovyn clan does not wish to settle into old elf havens such as the Elven Court. The Auzkovyn feel most comfortable as woodland nomads. At various times, they range in large or small groups over nearly the whole of Cormanthor, setting up temporary camps on the ground, in the treetops, and sometimes in cave entrances to the Underdark. Most of the Auzkovyn drow offer sacrifices to Vhaeraun, even if not all worship him as their patron deity. Unlike the other surface drow who've invaded Cormanthor, the Auzkovyn are willing to accept elves, half-elves, and possibly even Vhaeraun-worshiping humans into their clan, which may work to their advantage in the long run. As Vhaeraun worshipers who aren't set on occupying specific territory, the Auzkovyn drow get along fairly well with House Jaefre. Of course; for evil drow factions, "getting along well" means they don't slit each other's throats after they've hit each other with sleep-inducing arrows. House Jaelre. (7,945 drow). Decades ago, a house of Vhaeraun worshipers lost a civil war in Menzoberranzan. Calling themselves House Jaelre, they wandered the deep Underdark, too weak to retake their home city. Around the same time as the Auzkovyn clan came through the portal beneath the Abbey of Swords, House Jaelre drow found portals in the ruined gnome city of Blingdenstone that led into sections of Cormanthor once inaccessible thanks to Myth Drannor's powerful mythal. Unlike the Auzkovyn clan, House Jaelre drow seek to occupy the elves' original homes, particularly the area around the Elven Court. They're motivated in part by the hope that they can take over the elves' original mythals and wards then use the elven magic to keep out both the elves and their own drow enemies. A crafty drow sorcerer-rogue named Jezz the Lame heads the forces of House Jaelre charged with creating distractions in the Dales. These events help to keep the Dalesfolk's attention away from developments in the old Elven Court. At the moment, Jezz is having great success slashing into Mistledale. Spider-kissers (1,168 drow): This term is a catchall for Lolth-worshiping drow who splintered off the other groups or came into Cormanthor through other Underdark ways. They have no intention of permanently settling the surface. Rather, they plot to retake their home cities using the traditional drow engine of social change: civil war. The Lolth-worshipers (Ssinssriggorbb) prefer to cluster around entrances to the Underdark, even if that does make them vulnerable to raiders from the Underdark cities. Drow raiders, human bandits, and all manner of wild and dangerous forest creatures make Cormanthor a dangerous place to visit. At the heart of the forest, the failing mythal around Myth Drannor protects untold wealth and power, while trapping unspeakable evil within. Riven Armory: The characters find a map to an elven treasure cache that appears to be located near the fringes of the former Elven Court. If the map's annotations can be trusted, the hidden cavern contains several suits of powerful magic armor that fit anyone who dons them and give to wearers potent battle-spells and embedded powers. The catch is that the map is laid out manner that-frustrates even elves, with references to trees particular type and the shadows they cast at a particular time of day as guideposts. When the PCs figure the map out they discover that the catch is that drow of the House Jaelre group frequent the fore that area. If the PCs manage to overcome all obstacles and obtain the armor, they can use read magic to read the fine elven runes printed on it. The final problem is that each suit comes with strong magical geases to complement its powers, laying tasks and obligations on its wearers. Some suits even take their wearers on unforeseen journeys to strange ruins elsewhere in Faerûn.